We cherish the earth and the things we make are derived from her magical materials. Browse our store for Waldorf inspired crafts, wool breastfeeding and pregnancy dolls, wooden stepping stools, knitting needles, stone scultpures, beaded suncatchers, Maya Wrap baby slings, greeting cards and more! Custom orders are our specialty. Have a peaceful day. 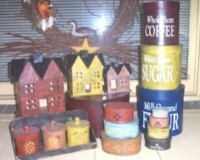 We carry a wide variety of hand painted primitive folk art. We have paper mache, reproduction treenware, signs, barn stars, and much more! Stop in and take a look at everything we have to offer. We do look forward to hearing from you! Primitive stitchery patterns. Holiday, seasonal, everyday patterns. We carry patterns designed for bread cloths, hand towels, candle mats, and tags. We also have mini patterns to create your own items for Christmas, Valentines, Halloween, Easter etc. for ornaments, bowl filler pillows and other smaller projects. Samplers, sayings, quilt blocks, wreaths, snowmen are just some of the categories. Original designs. New patterns added often. Reasonably priced.